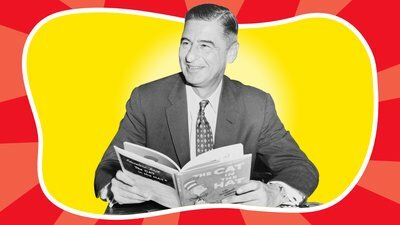 Dr. Seuss (Theodore Geisel) wrote his 46 books for children, but adults can learn a lot from his teachings as they embark on the path to a better physique. Sound familiar? It should, if you've ever read Dr. Seuss's timeless classic, "Oh, the Places You'll Go!" The book discusses taking responsibility for your life, whatever obstacles may come your way. And transforming your body is nothing if not overcoming a series of obstacles. Here are six essential lessons Dr. Seuss offers to help you along your fitness journey. Far too often, we take our cues on how to behave from our peers, friends, family, co-workers, television, and social media. When we finally notice this, it can feel like we've handed over control of our lives to others. To regain control of your life, act as if you're confident and in control, and soon you will be. In terms of fitness, the first step to a better physique is taking control of your workouts by front-loading them. Before you start planning the exercises you'll do or the foods you'll eat, think about the obstacles and distractions that might throw you off your plan. Does your job keep you working late? Do you have a long commute? Do you care for small children? Is money an issue? For any challenge you face, take the time to work out a solution. You can do it. Stay in control of your life by planning ahead. The DNA diet, the Paleo diet, the no-starch diet, and the grapefruit diet. Calisthenics, free weights, exercise machines. Carb-backloading, eating every 2 hours to stoke your metabolism... There are lots of paths we can take to improve our health. Maybe too many. Fitness buzzwords, new diets of the week, and trendy new workouts can all distract you from creating the core of a healthy life. Choose a diet and a workout routine that fit your lifestyle and that you can stick with over the long haul. Stay on your path! Just go right along. You'll start happening too! You obsessively search Google for the optimal training split. You meticulously analyze your macronutrient ratios to gain a nutritional edge. You read fitness forum after forum and diligently study research report after report. But aren't you forgetting something? Learning is great and has its place. But the main thing is to take action. Don't fall victim to analysis paralysis. When it comes to reaching fitness goals, the point is to get started, not to wait until you have all the answers. As Dr. Seuss says, "just go right along" and follow your path. Sometimes we tell ourselves negative things we would never say to someone else; it would be too hurtful to them. These old mental scripts that run in our heads can make us lose faith in ourselves and fall short of our fitness goals. The biggest asset for successful fat loss or muscle building or endurance is belief in yourself. When you believe you'll succeed no matter what, then no bad day at work, no subpar workout, no lousy food day will stop you from achieving your fitness objectives. You've just started a new program, and it's been gloriously smooth sailing. But then the winds of life change as they always do and throw you off course. The pounds you were shedding those first few weeks have started to sneak back on. You were getting stronger; now you feel weak. Your sleep practices were picture perfect, so why are you lying awake? Don't sweat these ups and downs. They're perfectly normal. Think of the path to your goal as riding a roller coaster, with exhilarating highs and challenging lows. Try to hang on and accept the good and the bad. Hard as they are, those tough periods help you grow so you can appreciate your victories all the more. I get it. Change can be scary and discomforting. Your friends might not understand your new lifestyle. Your family might scold you when you stop eating the way you used to. That's their problem, not yours. Once you leave the confines of the majority and start doing things your way, you may face opposition from unexpected places. Change is rarely easy and can sometimes be lonely. But it's usually for the best. It means you're growing. Create your own definition of what a healthy lifestyle and fit body look like to you—not to your friends or family or what social media tells you. Plan ahead for obstacles. Stay consistent. Stay focused. Keep moving forward, step by step, inch by inch. When you do, as Dr. Seuss says, "Oh, the places you'll go!"